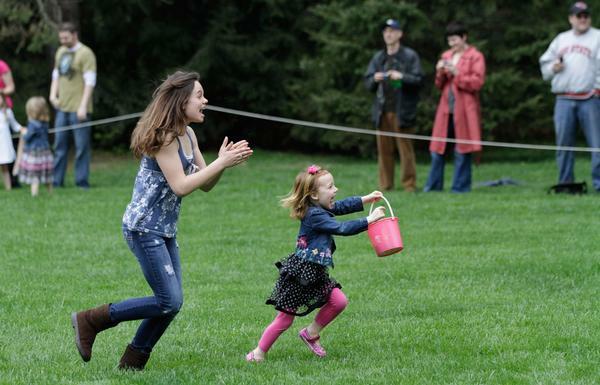 Brenna Fichtner, 12, of Columbus and her cousin Madeline Enright, 5, of Cleveland run back to their parents celebrating Madeline's victory in finding eggs following the annual Bexley Easter Egg Hunt on the back lawn of Jeffrey Mansion on Saturday, April 23, 2011. The Enright's were visiting the Fichtner's for the holiday weekend. The event was put together by the Bexley Celebrations Associations and Bexley Recreations Department along with help from Boy Scout Troop 166 and Girl Scout Troop 50199. The boy scouts filled 1,400 eggs with 22,000 jelly beans for over 600 children and adults to enjoy. For more photographs including another of these two kids take a look at the Easter gallery. Cute kids with baskets reacting to finding candy in surprise packages tucked away in secret spots. It is a moment filled with emotion and pretty fun to photograph. 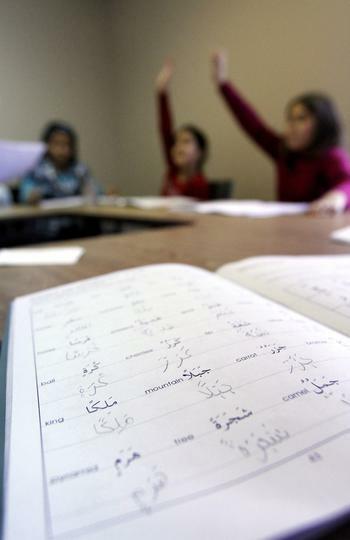 The challenge is that kids move fast, they move unpredictably and the event is done in 90 seconds. Plus after the egg hunt is over you never know if a parent is going to tell you they don't want their child's photograph in the newspaper. So planning ahead and getting a few safety shots is always a good idea. If you take a look at a few of the photos in the gallery, you'll see that I took some before photographs of the setup of the event and a father and son planning out his attack. I usually try to photograph at least one child with a parent and get a name before this type of blink-and-it's-over event even if that photo isn't the one I'm going to use. That way I definitely have a name and face I can photograph during the egg hunt. Unfortunately this time around the child I thought would be interesting to photograph ran straight out into the middle of the egg filled yard, picked up one egg and stopped. After a few seconds I had to move on to someone else and hope I could get a name just to make sure I had someone from the event. The one thing that is guaranteed is that Easter egg hunts are unpredictable. So be prepared to change plans and react to what you are seeing.. Also as a tip for parents, crouching down and photographing your child from your child's eye level or lower often makes for a much more interesting photograph. I wish I would have done it on the above photograph as the rope in the background wouldn't be bugging me as much. 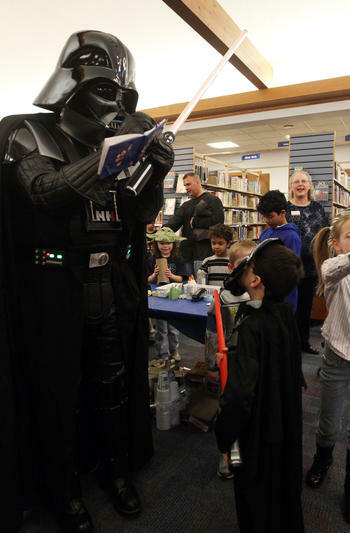 David Cauley, 6, of Delaware waits patiently as Darth Vader adds his autograph to Cauley's book during a Star Wars Day at the Powell Branch of the Delaware County District Library, 460 S. Liberty St., on Saturday, March 5, 2011. Cauley's mother said Vader is one of his favorite people. Vader is also known as Bill Kirsop. Members of both the 501st Legion and Rebel Legion attended the event in costume for the hundreds of kids and adults who came to enjoy the activities. See more photos from the event. Xing Teng, 11, of Westerville performs with other members of the Columbus Contemporary Chinese School during a ballet performance at the fourth annual Chinese Festival at Westerville Central High School on Saturday, February 12, 2011. The festival celebrates Chinese culture and is organized by the Chinese Culture Link and the Ohio Contemporary Chinese School. See more photos.